Peanut butter and chocolate is a combination I will never grow tired of. Though I love chocolate, I love it so much more when you add a little peanut butter. 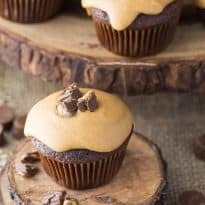 These cupcakes are so deliciously sweet and rich. If you have a sweet tooth, it will definitely satisfy it. They are also so easy to make. I used cake mix but if you have a chocolate recipe from scratch that you like, you can use that instead. Want more chocolate and peanut butter recipes? Check out my ultimate list! Deliciously sweet and sinfully rich! 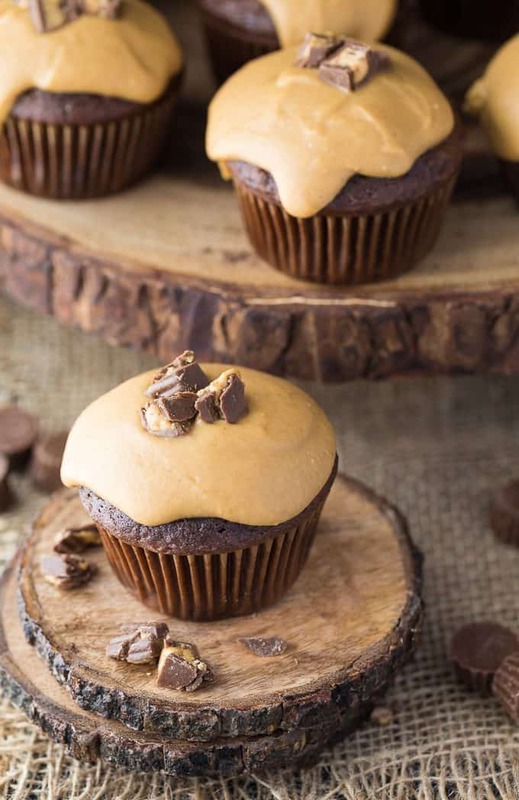 Chocolate cupcakes stuffed with Reese’s Peanut Butter Cup morsels topped with a smooth, creamy peanut butter glaze. Prepare cake mix according to the package directions. Mix in chopped Reese’s Peanut Butter Cups. Pour into muffin tins and bake for the recommended time (and temperature) as on the cake mix box. Allow to cool completely before coating with the peanut butter glaze. Combine peanut butter chips and cream in a deep bowl. Microwave on high for 1 minute. Stir. Add butter and microwave on high for 30 seconds. Stir. Add in icing sugar and stir till smooth. 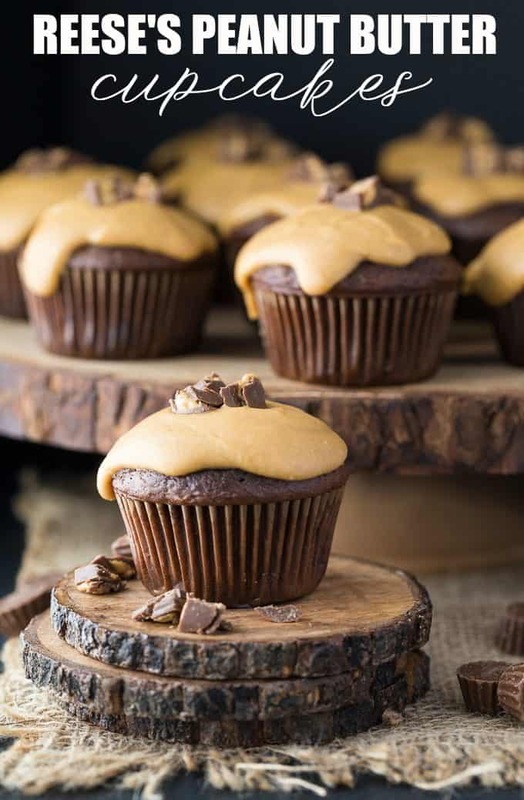 Spread glaze over cupcakes and top with one Reese’s Mini. Cool to allow glaze to solidify. I must make this for my peanut butter fans! These look like they’d be so delicious, and would be nice and easy to make. I can think of a few people that would love these. Icing sugar…is this equivalent to powder sugar? Yes, that is correct. We call it icing sugar in Canada. Oh, this makes me drool! 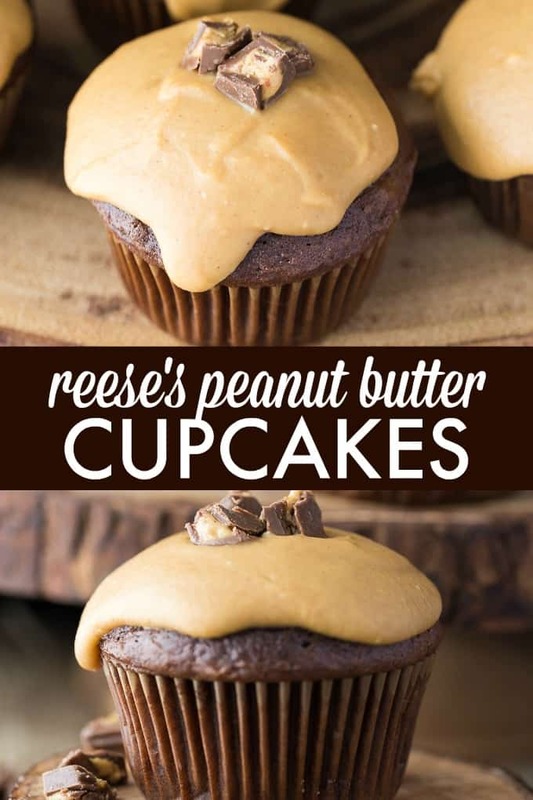 I just love Reese’s Peanut Butter Cupcakes! I will definitely be making this recipe. My two favorite flavors peanut butter & chocolate. Hey! Those rounds in your pics are coconut palm sections right?! Beautiful photos by the way. Really reach into the screen and grab one; P.
Yessss to all of this. Peanut butter and chocolate and cake- how could one go wrong!? These look too good! Reeses PB cups may just be my favorite candy!! These look so yummy, and I need them in my tummy stat! My family will love these! Thanks, for sharing! Visiting from Wined Down Wednesday Having the last name Rees I am always looking for Reeses snack ideas. They look yummy! Can’t resist Reeses . . I wouldn’t be able to resist these either! Yum! Pinned to share. Thanks for sharing your awesome recipes with us at Brag About It! Gorgeous presentation and I could go for one (or two) right now. These look to die for! What a perfect treat! Wow what a great combination! Thanks for the recipe, Sharing on FB. Thank you for sharing on Merry Monday! Have a great week! Oh my, these look yummy. I will be making them soon. Thank you for sharing at the Snickerdoodle Create~Bake~Make link party! These sounds great! Although I can’t have peanuts! Do you think I could use almond butter in place of the peanut butter chips? I would just cut up pieces of chocolate rather than chopped peanut butter cups for the top. Any suggestions would be awesome! And thank you!